The proper spelling of “Meroe” is actually “Meroë” but I lack the ability to produce such a character with my keyboard and do not wish to “cut and paste” the proper spelling of the name in every time. 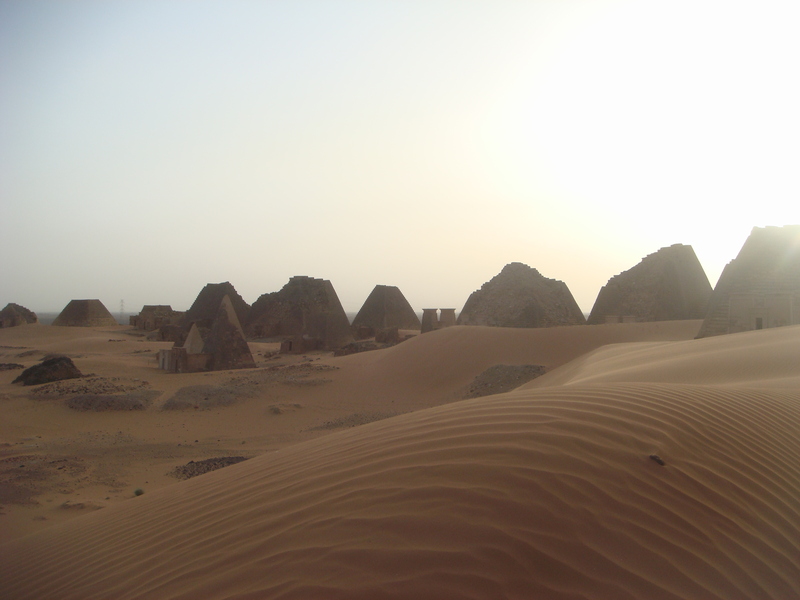 Meroe served as the last capital of the Kushite Kingdom that based itself here from approximately c. 600 BC – c. 350 AD. 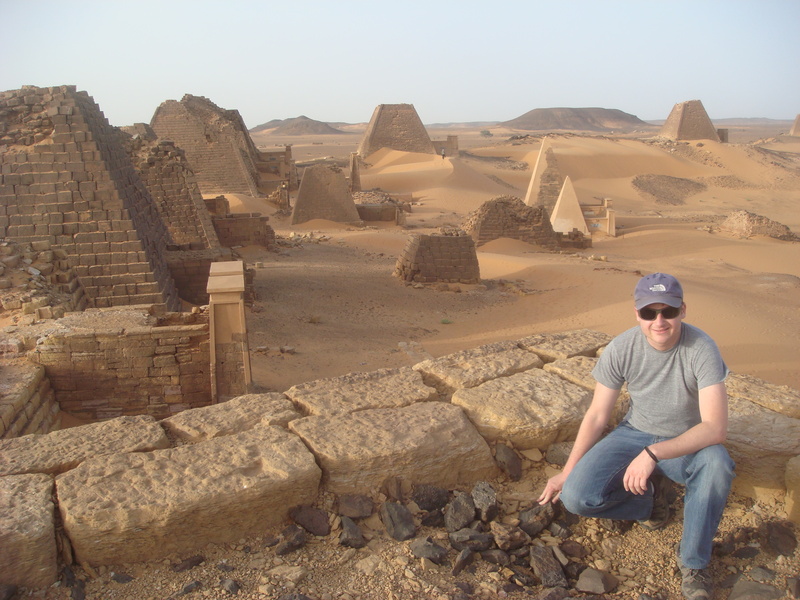 The wealth of the kingdom of Kush was due to international trade and a strong iron industry (the area used to have many trees that fueled the fires needed for working the iron). In the ancient world, iron was one of the most important metals and Meroitic metalworkers were among the very best. 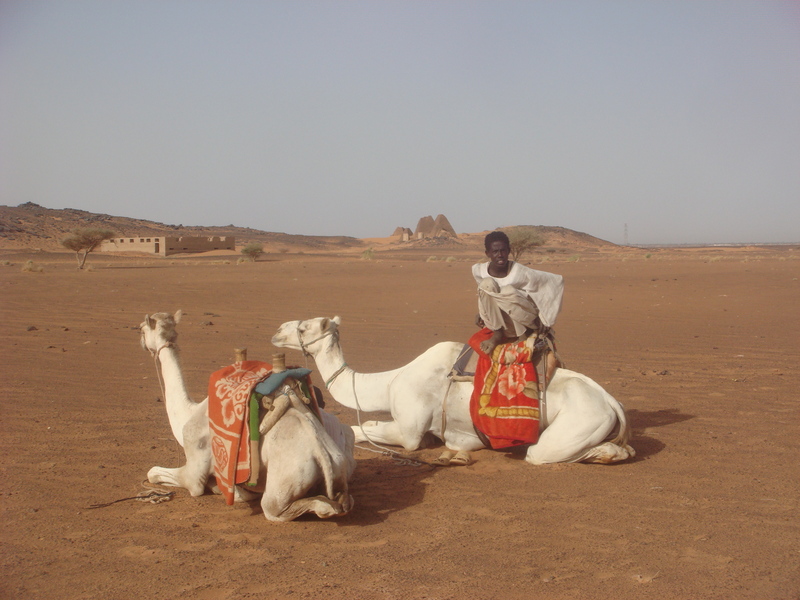 However, Meroe also exported textiles, pottery and jewelry. 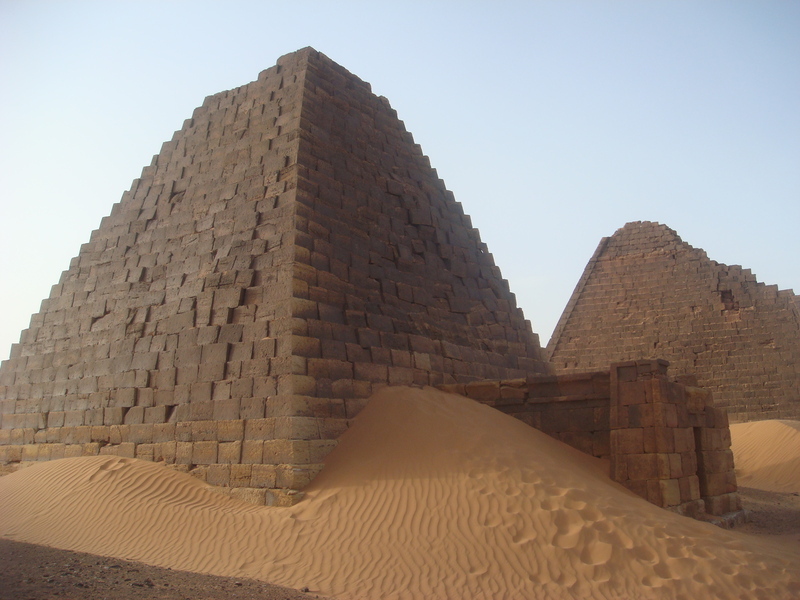 Their textiles were based on cotton and work on this product reached its highest achievement in Nubia around 400 BC. As if that were not enough, Nubia was also very rich in gold (It is possible that the Egyptian word for gold, nub, was the source of the name of Nubia). Trade in “exotic” animals from farther south in Africa was another feature of the economy. 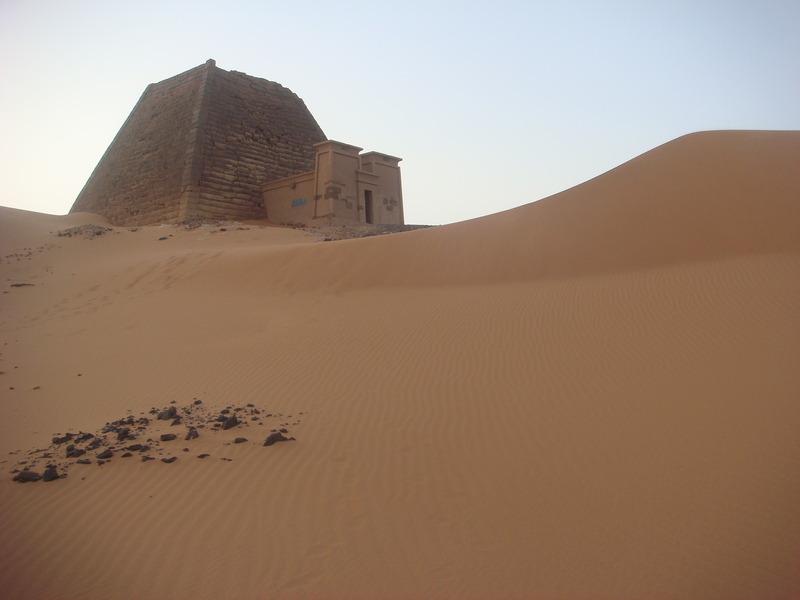 The Nubian pyramids at Meroe are the most prominent marker of the capital city that used to be found here… These pyramids used to have over forty queens and kings buried within them. 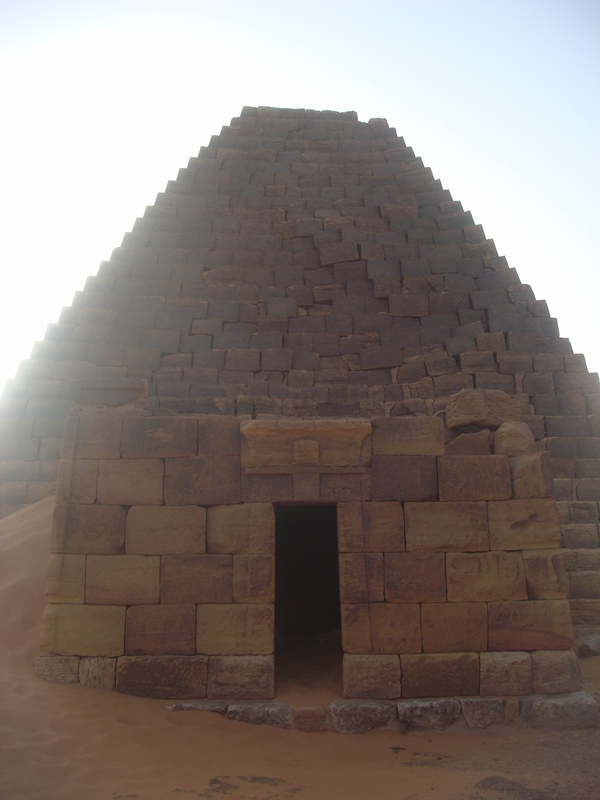 All of the pyramid tombs of Nubia were plundered in ancient times, but wall reliefs preserved in the tomb chapels reveal that their royal occupants were mummified, covered with jewelry and laid to rest in wooden mummy cases. 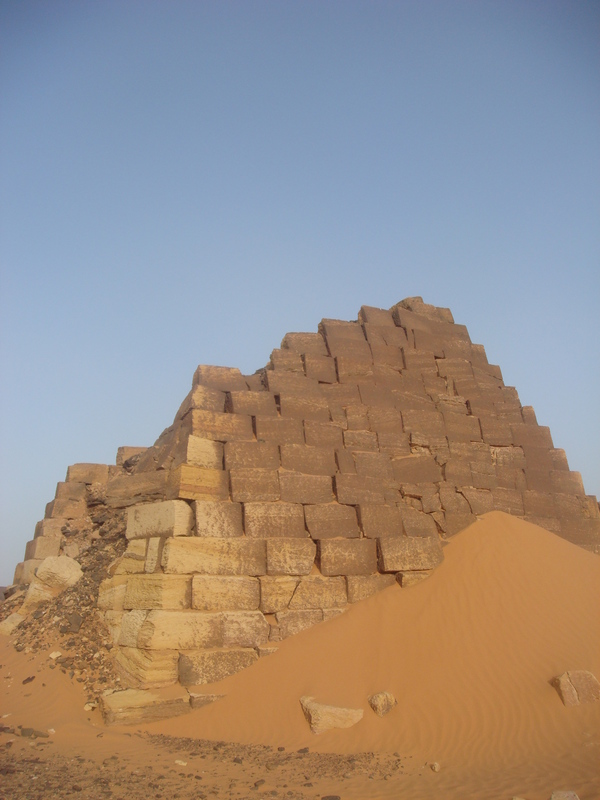 At the time of their exploration by archaeologists in the nineteenth and twentieth centuries, some pyramids were found to contain the remains of bows, quivers of arrows, archers’ thumb rings, horse harnesses, wooden boxes, furniture, pottery, colored glass, metal vessels, and many other artifacts attesting to extensive Meroitic trade with Egypt and the Hellenistic world. 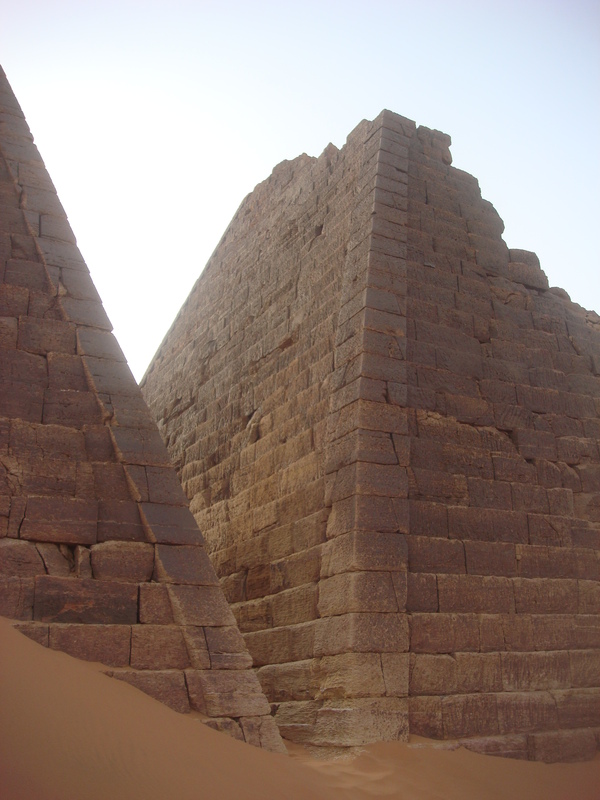 The physical proportions of Nubian pyramids differ markedly from the Egyptian edifices that influenced them: they are built of horizontally positioned stone blocks and range from approximately six to thirty meters in height, but rise from fairly small foundation footprints that rarely exceed eight meters in width, resulting in tall, narrow structures. Most also have small Egyptian-inspired offering temple structures abutting their base. By comparison, Egyptian pyramids of similar height generally had foundation footprints that were at least five times larger. 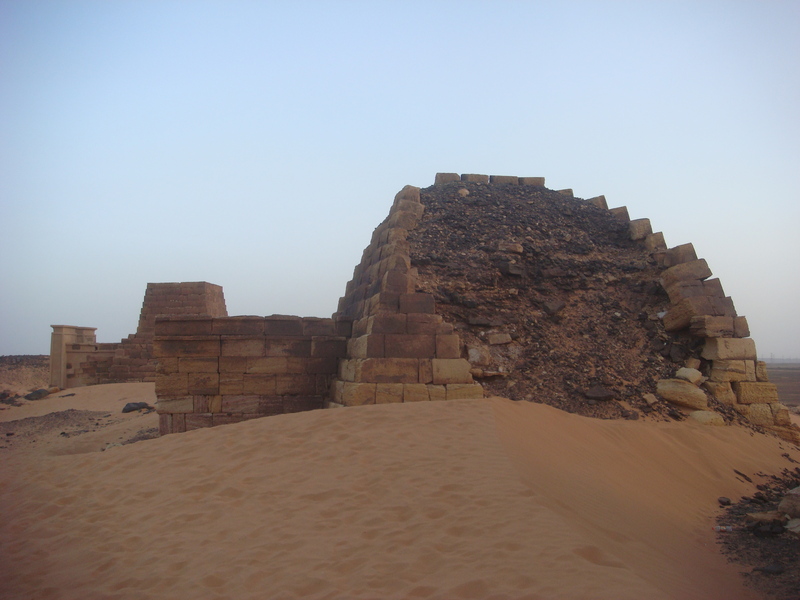 Modern archaeology in Sudan has been limited at best because of the various on-going conflicts in the region which has made archaeologists afraid to visit. I don’t understand this because if one wants to make the best discoveries, one must put themselves out there a little, but whatever. So, sites like this remain relatively unexplored. 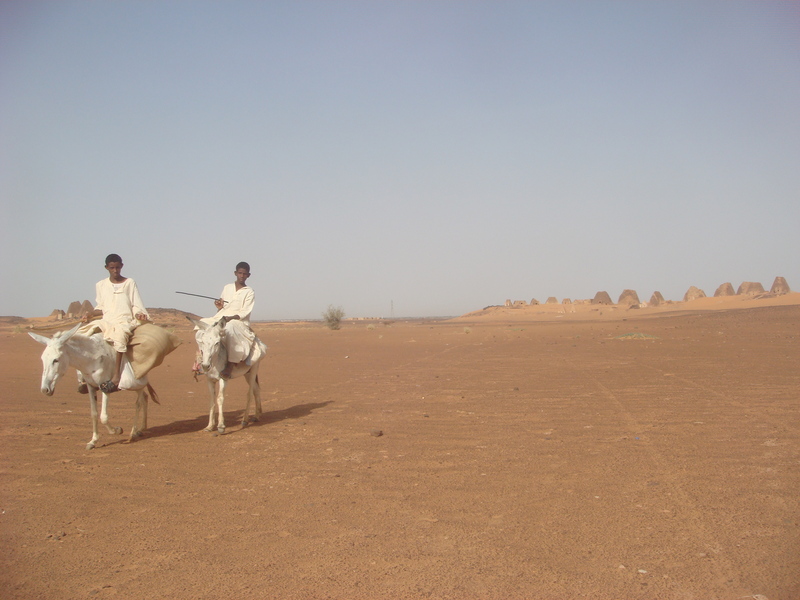 Giuseppe served as a surgeon in the Egyptian army during its occupation of Sudan and in 1834 he ventured out to Meroe. Once there, he used explosives to blow the tops off of more than 40 of the pyramids in search of treasure. 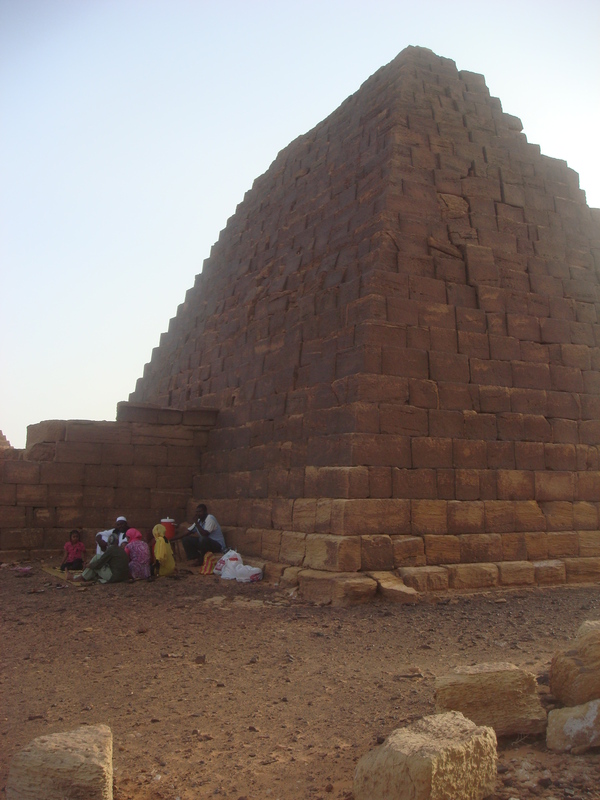 He did find gold in one of the pyramids, but had great difficulty in trying to sell it to European museums as no one believed that such finely crafted jewelry could have come from Sudan. Eventually, he was able to sell the gold though and it remains today at museums in Munich and Berlin. 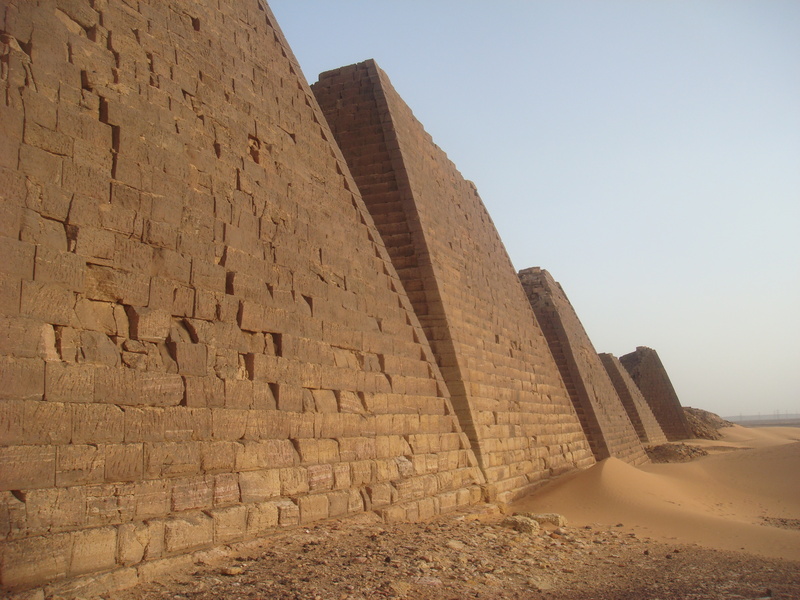 Tags: Bijrawiyah, Eleonora Ames, Justin Ames, Kingdom of Kush, Kushite Kingdom, Meroe, Meroe Pyramids, Nubia, Sudan, Team Ames. Bookmark the permalink. No, I am not familiar with the Hawad Project. Care to enlighten us? I have really been enjoying reading through your blog! I think the issue with the lack of Archaeology work being done in countries that have on-going conflicts is that most Archaeologists rely on grants and similar sources of funding for their work. A museum or university or other sort of trust is unwilling to hand out funds to an expedition where there is a serious risk that they could lose expensive equipment or even individuals. Your point about the lack of support for archaeological expeditions is well taken and makes sense. It’s certainly a pity though as I have seen many sites in Sudan, Afghanistan and parts of Pakistan that are just begging to be properly explored.